I had been meaning to read this work for quite some time, as it has quite a high reputation in peak oil circles. In particular, it has been cited directly to me in contexts where I have disputed the inevitability of the collapse of our civilisation. Now that I have read it, I can see that the high reputation is definitely deserved, although I have drawn somewhat optimistic conclusions from it. Click ‘full post’ for text. Tainter’s work was originally published in 1988 and has the feel of a work which is establishing a new field of study. Tainter is concerned to explore what ‘collapse’ means, when applied to a society; how collapse happens; and, in the conclusion, to draw some possible lessons for our present situation. The first chapter is a swift survey of eighteen historical examples of collapsed societies around the world, from the Harappans to the Hohokams. This serves to introduce the field that Tainter wishes to study, and also indicates the absence of rigorous empirical investigation. This is the cue for Tainter to begin his systematic analysis. He outlines what is meant by ‘collapse’, describing it as “a matter of rapid substantial decline in an established level of complexity. 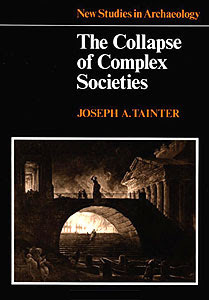 A society that has collapsed is suddenly smaller, less differentiated and heterogeneous, and characterised by fewer specialised parts…” Then in chapter three, Tainter surveys the explanations commonly given for why a particular society collapses, finding them all more or less deficient, and saving an especial scorn for ‘mystical explanations’ (eg Spengler or Toynbee), about which he writes: “Mystical explanations fail totally to account scientifically for collapse. They are crippled by reliance on a biological growth analogy, by value judgements, and by explanation by reference to intangibles.” In the course of this chapter he also gives a resounding declaration of the benefit of excluding value-judgements: “A scholar trained in anthropology learns early on that such valuations are scientifically inadmissible, detrimental to the cause of understanding, intellectually indefensible, and simply unfair”. This reads rather quaintly today, not least if the arguments that Robert Pirsig advances about anthropology in Lila are anywhere near being correct. However, this doesn’t really impact upon Tainter’s project. Tainter then takes the best existing explanation for collapse (economic) and proceeds to develop a hypothesis to explain why complex societies might suddenly shift from a more complex to a less complex state. His thesis can be concisely stated: increasing complexity gives rise to diminishing marginal returns on investment; when those returns become negative, the society has a progressively diminishing capacity to withstand stress, and is vulnerable to collapse. Essentially at point C3 there is no benefit from the increase of complexity (C3-C1) – hence the collapse from C3 to C1. – investment in sociopolitical complexity as a problem-solving response often reaches a point of declining marginal returns. What happens is that, as a complex society initially develops, there is a very high return on investment in complexity – the resources made available through that adoption of complexity are far higher than are used up through the complex organisation itself. However, over time, the ‘low hanging fruit’ are used up, and for every increase in complexity there is a lower and lower resource return until there comes a point where simply maintaining the existing complexity has a negative impact upon available resources – in other words, the resources are more efficiently deployed through a less complex system. Tainter gives a number of different specific and small-scale examples where this decline in marginal returns applies, for example in terms of the return on research and development investment, or medical research, but his next chapter applies the theory to understanding three different examples of collapse. The most telling example, to my mind, was that of the farmers in the latter stages of the Western Roman Empire, who were taxed more and more heavily in order to maintain the apparatus of the Roman state, and who eventually welcomed the barbarian invasions as a release from what had become Roman oppression. A Roman structure of high complexity had been viable for as long as there were increasing resources made available – and this was accomplished through conquest. However, once the limits of conquest were reached (either with the German tribes, whose relative poverty made their conquest uneconomic, or through coming up against another Empire strong enough to resist Rome, eg the Parthian) then the model of development became untenable. The accumulated resources available to Rome were drawn down, its capacity to absorb shocks to the system was eroded, and thus the collapse of that form of complexity became a matter of time. As Tainter writes, “Once a complex society enters the stage of declining marginal returns, collapse becomes a mathematical likelihood, requiring little more than sufficient passage of time to make probable an insurmountable calamity”. As a complex society enters into this terminal phase, the advantages to retreating to a previously existing level of complexity become more and more obvious, and local communities start to shift their allegiance: “…a society reaches a state where the benefits available for a level of investment are no higher than those available for some lower level…Complexity at such a point is decidedly advantageous, and the society is in danger of collapse from decomposition or external threat”. The only way to avoid a collapse is for the society to access a new resource which increases the return on investment once more. One intriguing aspect that Tainter draws out in his closing remarks is that collapse is only possible where there is a power vacuum. That is, in a situation of conflict between states collapse does not occur, there is simply a transfer of control from one polity to another, without any diminishment in levels of complexity. However, this does mean that when collapse happens it happens systemically across several different polities simultaneously. To this lay reader Tainter’s principal conclusions seem both sound and helpful. The idea that societies collapse into lower levels of complexity as a direct result of decreasing marginal returns on investment seems plausible, robust and open to various forms of empirical investigation. How far Tainter is correct in this thesis is something that professionals in his field can take forward. My interest is with the implications for our present crisis, for it seems unarguable that our existing society has entered the realm of diminishing returns on investment (seen most clearly through peak oil) and so I end with these various comments and questions. – more broadly Tainter’s analysis is very encouraging for all those wishing to see a relocalisation of economies, especially with regard to food supply. This entry was posted in book review, crisis, foreign relations by Elizaphanian. Bookmark the permalink. Thanks Sam. I remember reading this at the time and enjoying it. Reading it again in the light of almost finishing Tainter, I think this is an excellent review. The removal of a particular level of human complexity does not, of itself, lead to depopulation. This is true enough, though it depends what kind of complexity is removed. If merely political complexity, then possibly. But if it is also agricultural complexity, then it is a more difficult question. And this, I think, is one of the key theoretical and practical issues to be addressed by the Transition movement: what level of social complexity is required for an agricultural output that is sufficient for a given population density? Or, what level of population density is sustainable given the possible level of agricultural complexity in a post-collapse society?